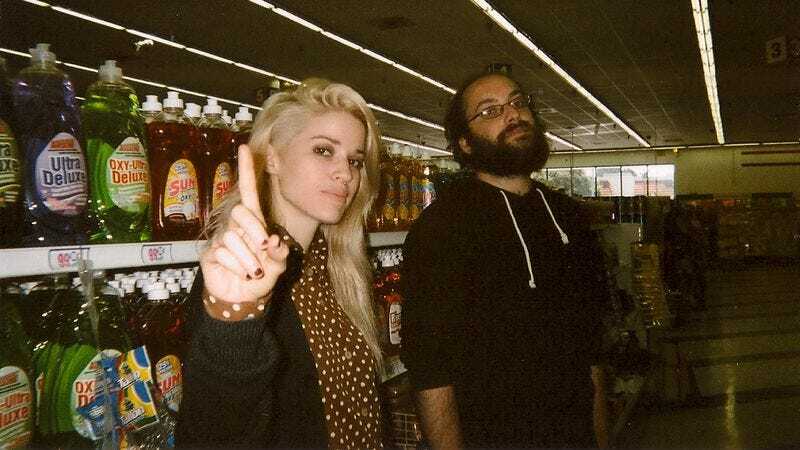 Los Angeles duo Dirty Dishes gleefully eschews genre descriptors. On Guilty—released this week on Exploding In Sound records—the band expands out in every direction, at times choking out empty space with all-consuming distortion, then quickly shifting into contemplative ambiance. It’s a record that’s dynamic, and never beholden to anything other than the shifting muses of the pair that created it. The A.V. Club is premiering the video for “Thank You Come Again,” Guilty’s raging opener, which is directed and edited by Pat Bishop of the comedy group Women. Bishop’s absurdist bent informs the video as the band’s bassist Alex Molini is subjected to a bevy of embarrassing pranks during his late-night shifts at a doughnut shop. The video reflects Dirty Dishes’ duality: It may indulge in sugar-sweet melodies, but it’s just as keen on destroying them without a second thought.